Play Action Bank Slot Online with 500 Free Spins! 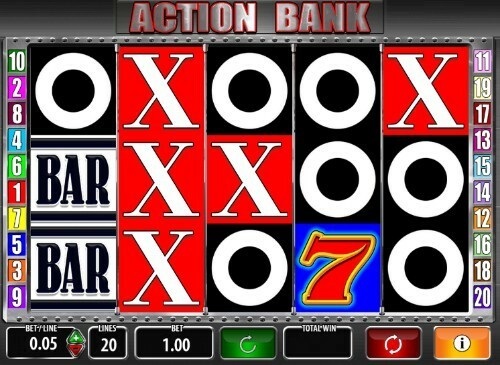 Action Bank is a 5 reels, 20 paylines Online Slot Game by Barcrest. Action Bank has Wilds, Scatter Symbols, Multipliers and Free Spins features, and an RTP of 96.16%. We’re happy to offer this online slot here at Rose Slots, where we also offer more than 500 great UK online slots like Fluffy Favourites, Starburst, Rainbow Riches and Great Rhino. Action Bank was first released by Barcrest in 2016, but some people reading this review and looking at the pictures will have a strange sense of deja vu, and a feeling that they once played this years before. If that’s you, don’t worry - you may well have done. Action Bank was a physical slot machine long before Barcrest took the step of digitizing it and adding it to their range of online slot games. So how has it fared now it’s available to online slots players? We think it’s done very well. Everything that made it a fun slot to play in the flesh is present here in its virtual counterpart. In fact, it’s taken advantage of the new format to offer some extra bonus features. Action Bank looks basic and simple, and that's because it is. Barcrest is known for their traditional online slots, and you'll rarely see them attempt to make a slick video slot. They know what their strengths and weaknesses are, and they'll always play to their strengths. The graphics of Action Bank are big, blocky and colorful. They're just on the right side of appearing awkward and clumsy given the size of the symbols, but you can at least always see what you're doing. The slot comes with five reels and three rows, which contain twenty fixed paying lines to look for. Alarmingly, there are only four standard symbols in the base game, which would be low even for a one-armed bandit. They're a huge red seven, the classic ‘Bar,' a huge white ‘X' on a red background and a white ‘O' in a black background. From appearances alone, you might think the objective is to play an online slot game version of noughts and crosses or tic-tac-toe, but that isn't the case here. The ‘O' symbols have no value at all in the base game unless you can find five of them, in which case they'll turn into something completely different. We'll talk about that when we get to the bonus features. The wild in Action Bank is a joker, and he can swap himself in for any of the three basic symbols to make paying lines for you. We say three because he won't substitute for the white ‘O' symbols. They're technically scatters, and if five of them turn up on the same spin, they'll transform into a golden vault, thus starting one of the slot's bonuses. Making traditionally-themed online slot games is what Barcrest is best known for. They've been one of the biggest names on the UK gambling scene since the late 1960s when they were originally formed. Once upon a time, they were the leading manufacturer of fruit machines and other slot games not only in Great Britain but mainland Europe too. As a developer with a reputation for success and quality they’ve been acquired in takeovers not once but twice, and are currently the property of Scientific Gaming. They still operate under the Barcrest banner, though, and have adapted seamlessly to the task of creating online slots in the modern era. They know their brand appeals most to those players who remember the earlier era of slot games, and so they leave modern video slots to other people. With a Barcrest slot, you can expect to find a simple game which perhaps has one or two bonus features on top of it to add to the experience. It’s a winning formula - perhaps best demonstrated by the groundbreaking success of their Irish-themed Rainbow Riches series. Since the first Rainbow Riches slot launched online in 2009, it’s become a money-making sensation on the UK online slots scene, and added even more value to the Barcrest brand. As we just said, the bonus features in this slot are activated by finding five of the ‘O’ symbols on the same spin. When that happens, Action Bank will start one of its two bonus features at random. Neither of these two bonuses is present in the physical version of the slot - that makes their inclusion something of a compromise between appeasing those who enjoy the simplicity of the original and appealing to a wider audience, which is used to more complex online slots. A Free Spins round is one of the two bonus features on offer, and it's a little unorthodox. Your five ‘O' symbols will now be five golden safe vault symbols. Behind each of those symbols is a specified number of free spins, and so you have to select one of them and find out what it's hiding. That could be as little as five if you choose the unluckiest option, but as many as thirty if you choose the top value. If you're disappointed with your selection, you'll be given a chance to gamble for more free spins before you start, but do be aware that if you lose the gamble, you'll get no free spins at all. The free spins can be re-triggered the same way they started, and during them, you'll see some new ‘double' symbols on the reels which increase the value of line wins. If you go into this with a high number of free spins, you should be on for a profitable experience. The second of the bonus features is Big Bank Bonus. This is an instant-win prize picker round which is all about multipliers. You'll be taken to a new screen, upon which is a grid of sapphires, rubies, and diamonds. They'll be shuffled and then hidden. You're then allowed to make a free selection from the entire grid until you've hit the same option three times. Whatever you have three of will determine which multiplier you'll be awarded. If you have three diamonds, your payout will be 500x stake. That's a good reason to choose carefully!